Due to recent issues with unsupported versions of .NET being installed on Exchange servers, as well as the fact that Exchange Server requires specific versions of .NET to be installed (Exchange Server 2013 System Requirements & Exchange Server 2016 System Requirements), there is a need to quickly query the installed version of .NET on Exchange servers. 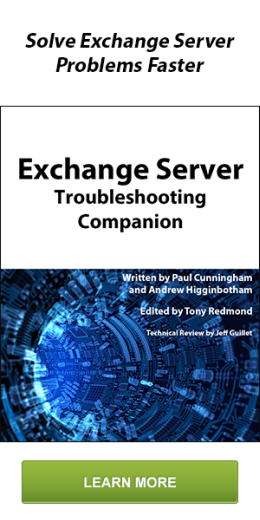 I have also been involved in several Exchange support escalations where updating the Exchange servers from .NET 4.5.1 to 4.5.2 resolved CPU performance issues. Fortunately, my coworker and fellow Exchange MCM Mark Henderson wrote this quick and easy way to query the currently installed version of .NET. To query the local Registry using PowerShell, execute the below command in an elevated PowerShell session. You can then use the table below to reference the installed version of .NET. For instance, if the returned value is 379893, then .NET 4.5.2 is installed. I put together a PowerShell function to do this in a little clearer fashion.